I'm proud to present a new series on the blog: Facebook-free. After having left Facebook 10 months ago now, I'm happier than I ever could have imagined with my decision—and couldn't picture going back. 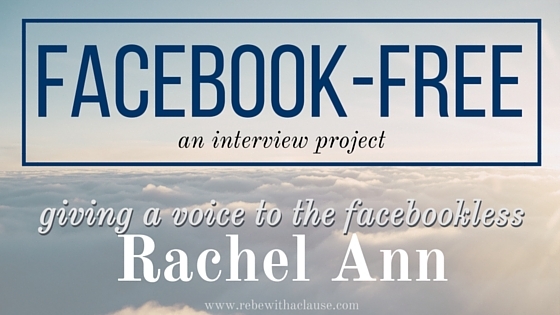 In an effort to show that there are many others living a Facebook-free life as well—each with their own reasons and insights—I've started the Facebook-free interview series as a new side project. Walk us through your decision to leave. Was it planned? Spur of the moment? My decision was one of those where my finger was on the mouse for quite a while and finally I clicked. I had been tired of Facebook rants, doing showboating challenges (even though they were for amazing causes - though how many of those people knew what they were supporting? ), postings of how #blessed someone was because they got a Pumpkin Spiced Latte, someone venting about this minor thing , pictures of babies and pets; and just the lack of interest in what my "friends" were posting. I would rather call someone up on the phone to catch up, than see the drink they had this morning. Those of you who receive my monthly email already know about this, but tonight I finished my 4-week session of Lindy Hop B (8-count). I started in August with Lindy Hop A (6-count), and both classes were through Jumptown Swing in Madison at just $25 for the entire month. If that's not cheap enough (which it totally is), once you've paid for one of these classes, you can retake it as many times as you want—for free! So if it takes you a bit longer to get the moves, or if you want a refresher, you can pop back in to the class when any future session is offered. (Right now each is offered every other month; they alternate between offering Lindy Hop A and Lindy Hop B). I'm so thankful Madison has a swing community that offers these classes! They also have weekly social dances at the Brink Lounge and monthly dances at the Madison Circus Space (yeah, I didn't know we had that either). If you're in the Madison area, I highly recommend these classes as a fun new activity to try out! And though I'm hoping this is just the start of my journey learning lindy hop, I can now check off my life list item of taking a lindy hop dance class—which got added to the list this spring when I was in Montpellier. I am so grateful our society provides public libraries to its citizens. Not only can you read almost any book or magazine for free—in print or digitally—but public libraries are to thank for a huge amount of other efforts, programs and services that make the world a better place. Since coming back home to Wisconsin at the end of July, I've gone from being five books behind schedule to two books ahead of schedule on my Goodreads 2015 challenge of 35 books. I'd gotten behind when I only allowed myself to read books in French during my two months in Montpellier, France. The English ban definitely helped with the French learning, but I only finished one book in that two-month period: "James et la grosse pêche" ("James and the Giant Peach"). While I love using my kindle to read while traveling, I so enjoy reading from a real book—which our library has allowed me to do these past two months. Have you read any good books this summer? And do you frequent your local library? It's never too late to sign up for a free library card! "Oh my gosh!" I said aloud, in disbelief. I was sitting in Hannah and Herm's living room—mind wandering—and then the thought randomly appeared. But, can it be? That'd be too crazy, but I think it's true! If there were any time to believe in any sort of destiny, this was it. I'll explain: Do any longtime readers remember my Düsseldorf Project? It had been off the blog for a while (I've since brought it back), but it started in 2012 while living in Spain as a push to see more of Europe. Last Tuesday in Chicago I applied for my France long stay visitor's visa. I'm applying to stay for 12 months (6-12 months), but you can also apply to stay from 3-6 months. A student visa would be nice, since health care for the year is super cheap (like, 300 or 400 euros), plus you're legally allowed to work some hours as well. A work visa is hard to get, just like in Spain, because you basically have to prove why a French person can't do your job. And you also need to already have a business willing to sponsor you. A visitor's visa is for anyone seeking to spend more than three months visiting France. To get this visa, you basically have to prove that you can support yourself for the amount of time you wish to spend in France. You are not allowed to work in France, so I can't teach English lessons on the side or anything. But since my freelancing job is virtual, I can continue working there while in France, so this was the best visa for me at this time. Even when I tried to underestimate what I could do in two weeks, I still managed not to finish everything. But that's okay, because I've made progress in lots of areas that weren't on this month's focus list! As always, completed items are bold, and completed items that weren't on my original list are both bold and italicized.